Shaun Derry says three wins from five games could be enough for Notts County to retain their League One status. Notts are three points from safety going into Saturday's clash with Port Vale and the manager believes the club's three home games will be key. "I feel 49 points might just be enough, and 50 will be enough," he said. "There are some monumental six-pointers. "We need to win our home games and if we lose one, then we are going to need to win one of our away games." Derry told BBC Radio Nottingham: "The pressure is there, I'm not going to deny that. Thankfully, we have shown we can adapt to it." The Magpies were beaten 3-1 at Brentford last Saturday, but won their three games prior to that against Carlisle, Crewe and Colchester to resurrect their survival hopes. 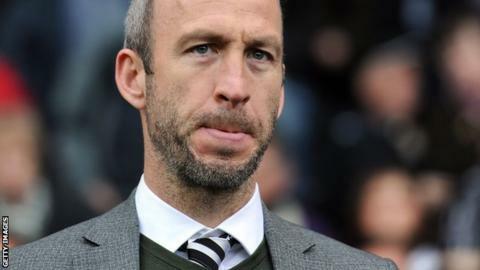 Read more on Notts manager Shaun Derry on defeat by Brentford.